Always wear your seat belt when travelling in your vehicle. You must also comply with the legislation of the particular country you are in. Make sure that the rear bench seat is locked in position correctly so that the rear seat belts will operate efficiently. 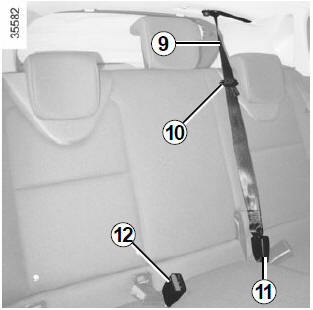 Refer to the information on the “Rear bench seat: functions” in Section 3. 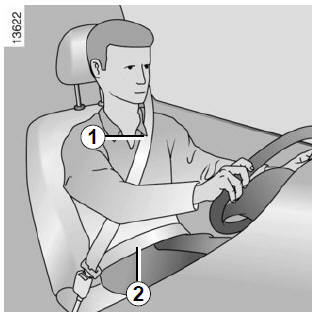 Incorrectly adjusted or twisted seat belts may cause injuries in the event of an accident. Use one seat belt per person, whether child or adult. Even pregnant women should wear a seat belt. In this case, ensure that the lap belt is not exerting too much pressure on the abdomen, but do not allow any slack. Before starting, first adjust your driving position, then ask all occupants to adjust their seat belts to ensure optimum protection. Sit well back in your seat (having first removed your coat or jacket). adjust the position of your headrest. adjust the position of the steering wheel. Sit with your back firmly against the seatback. Shoulder strap 1 should be as close as possible to the base of the neck but not on it. Lap belt 2 should be worn flat over the thighs and against the pelvis. The belt should be worn so that it is as close as possible to your body, i.e. : avoid wearing heavy clothing or keeping bulky objects under the belts, etc. Unwind the belt slowly and smoothly and ensure that buckle 3 locks into catch 5 (check that it is locked by pulling on buckle 3). If the belt jams, allow it to return slightly before attempting to unwind it again. If your seat belt is completely jammed, pull slowly, but firmly, so that just over 3 cm unwinds. Allow it to return slightly before attempting to unwind it again. If there is still a problem, contact an approved dealer. This lights up on the central display when the engine is started then, if the driver’s or front passenger’s seat belt (if this seat is occupied) is not fastened and the vehicle has reached approximately 12 mph (20 km/h), it flashes and a bleep sounds for around 2 minutes. Note: an object placed on the passenger seat base may activate the warning light in some cases. a rear seat belt is fastened or unfastened. 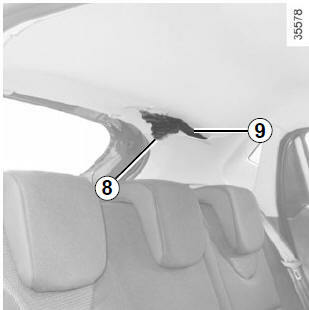 Check that the rear passengers are wearing seat belts and that the number of seat belt shown as fastened corresponds to the number of rear bench seat places occupied. Press button 6 to adjust the seat belt height so that shoulder strap 1 is worn as shown previously. Press button 6 and raise or lower the seat belt. Make sure that the seat belt is locked in position correctly after you have adjusted it. Press button 4 and the seat belt will be rewound by the inertia reel. Guide the belt. The belts are locked, unlocked and adjusted in the same way as the front belts. Unwind belt 9 slowly from its housing, then fasten buckle 8 into the corresponding black catch 11. Fasten sliding buckle 10 into the corresponding red catch 12. 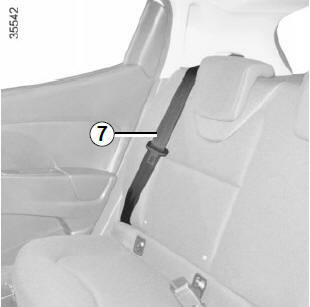 Check that the rear seat belts are positioned and operating correctly each time the rear bench seat is moved. The following information applies to the vehicle’s front and rear seat belts. 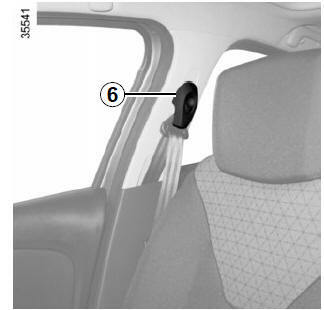 No modification may be made to the component parts of the originally fitted restraint system: seat belts, seats and their mountings. For special operations (e.g. fitting child seats), contact an authorised dealer. Do not use devices which allow any slack in the belts (e.g. clothes pegs, clips, etc. ): a seat belt which is worn too loosely may cause injury in the event of an accident. Never wear the shoulder strap under your arm or behind your back. Never use the same belt for more than one person and never hold a baby or child on your lap with your seat belt around them. The belt should never be twisted. 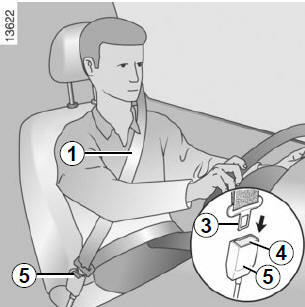 Following an accident, have the seat belts checked and replaced if necessary. Always replace your seat belts as soon as they show any signs of wear. When putting back the rear bench seat, make sure the seat belts are correctly positioned so that they can be used properly. Make sure that the buckle is inserted into the appropriate catch. Ensure that no objects are placed in the area around the seat belt catch as they could prevent it from being properly secured. Make sure the seat belt catch is properly positioned (it should not be hidden away, crushed or flattened by people or objects).